I received a call from your court saying that I owe money. Is this call legitimate? No. The U.S. Court of Federal Claims DOES NOT call, email, or send letters requesting money or personal identifying information. What kind of cases are heard by judges of the court? As established by Congress in 1855, the purpose of the court is to allow citizens to file claims for money against the federal government. To read more about the court’s history, please click here. The court has nationwide jurisdiction and its judges may hear cases anywhere in the United States. What is the scope of the court’s jurisdiction? The court is authorized to hear primarily money claims founded upon the Constitution, federal statutes, executive regulations, and contracts (express or implied in fact) with the United States. The court’s primary jurisdiction lies in 28 U.S.C. § 1491, known as the Tucker Act. Under this and other statutes passed by Congress, the court may hear a variety of specialized claims against the federal government including contract claims, bid protests, military pay claims, civilian pay claims, tax claims, Indian claims, takings claims, Congressional reference cases, vaccine injury claims, and patent and copyright claims. The President of the United States, upon the advice and consent of the U.S. Senate, appoints judges to the court. 28 U.S.C. § 171(a) states that there shall be 16 judges that constitute the court. Among the 16 judges, the President designates one to serve as chief judge. 28 U.S.C. § 171(b). How long does a judge serve on the court’s bench? Judges are appointed for 15-year terms of active service. 28 U.S.C. § 172(a). Before completion of the 15-year term, a judge may retire based on age or mental or physical disability. 28 U.S.C. § 178(a), (c). In certain limited circumstances, a judge may be removed from office for “incompetency, misconduct, neglect of duty, engaging in the practice of law, or physical or mental disability” by the U.S. Court of Appeals for the Federal Circuit. 28 U.S.C. § 176(a). After a judge has served his or her 15-year term of active service, he or she may retire or be appointed to serve another 15-year term upon the advice and consent of the U.S. Senate. 28 U.S.C. § 178. A judge who retires upon the completion of his or her 15-year term receives the title of “senior judge” regardless of age. 28 U.S.C. § 178(e). Judges who retire before the end of a 15-year term upon reaching the requisite age and years of service also receive the title of “senior judge.” 28 U.S.C. § 178(a), (e). Senior judges are not counted in the number of judgeships authorized, which is 16. 28 U.S.C. § 178(e)(2). Retired senior judges receive an annuity. 28 U.S.C. § 178(a), (b). A retired senior judge may elect to relinquish the title of senior judge and the associated annuity in order to engage in the practice of law or fully retire. Do senior judges continue to serve the court by hearing cases? Pursuant to 28 U.S.C. § 178(d), senior judges are subject to “recall” at the discretion of the court’s chief judge, “to perform such judicial duties with the Court of Federal Claims as may be requested of the retired judge for any period or periods specified by the chief judge.” In order to continue receiving an annuity, a senior judge must serve up to 90 days in a year if asked to do so by the chief judge, unless the senior judge is unable to do so because of illness or disability. The acts and decisions of a senior judge performing judicial duties at the court have the same force and effect as those of judges in regular active service. 28 U.S.C. § 178(d). What is the Office of Special Masters? The Office of Special Masters, an office within the U.S. Court of Federal Claims, was created by Congress pursuant to the National Childhood Vaccine Injury Act of 1986. 42 U.S.C. § 300aa-12(c). The Act establishes the National Vaccine Injury Compensation Program under which individuals may bring claims for alleged vaccine-related injuries or deaths. 42 U.S.C. § 300aa-10. These petitions are filed with the court and adjudicated by the court’s special masters. 42 U.S.C § 300aa-11(a). How are special masters appointed? Special masters are appointed by a majority vote of the judges of the court. The judges may appoint up to eight special masters. 42 U.S.C. § 300aa-12(c)(1). How long do special masters serve with the court? Special masters serve four-year terms. 42 U.S.C. § 300aa-12(c)(4). Upon the expiration of a term, a special master may seek reappointment by the court. Judges have discretion to grant reappointment by a majority vote of the judges. 42 U.S.C. § 300aa- 12(c)(1). Where can I find more information on the court’s Office of Special Masters? For information on the Office of Special Masters, please visit this page. Will my case be tried by a jury? No, the Court of Federal Claims does not provide juries in any trials. If a civil case proceeds to trial on the merits, the format will be a bench trial, meaning that the judge will act as the finder of fact and decide the case. 28 U.S.C. § 174(a). Who will defend the case on behalf of the government? Defense counsel for every case in this court is an attorney from the Department of Justice, regardless of whether the suit is against the Department of Health and Human Services, the Environmental Protection Agency, the Department of Defense, or any other federal agency or entity. Where do I find statistics regarding the caseload of the court? Electronic Case Files (“CM/ECF”) system? Information about electronic filing and CM/ECF is available here. If I am appearing pro se, can I get a CM/ECF account and file electronically? You must be an attorney who is a member of the U.S. Court of Federal Claims Bar to obtain a CM/ECF account. If you are not an attorney, you cannot normally obtain a CM/ECF account or file electronically. You may file an Application to Proceed In Forma Pauperis along with your complaint or petition. For more information, click here. What hours are you open for filing? The courthouse is open to the public from 8:30 a.m. to 4:30 p.m. Monday through Friday, except federal holidays. A night box is provided for filing with the Clerk’s Office between 5:15 p.m. and 12:00 midnight on any business day for any paper due that day. The night box is located inside the gate at the garage entrance on H Street. See Rule 77.1, Rules of the United States Court of Federal Claims. CM/ECF allows attorneys to file documents electronically 24 hours a day, 7 days a week. For information about system outages, check announcements at http://www.uscfc.uscourts.gov/. Is a document considered timely if it is served on the due date? All documents must be delivered to the court or electronically filed no later than the due date. See Rule 5, Rules of the United States Court of Federal Claims. If I am filing a document in paper form and not electronically via the CM/ECF system, how many paper copies should I send to the court? When filing a document in paper form, a party must file an original plus two copies. See Rule 5.5(d), Rules of the United States Court of Federal Claims. At its discretion, the court may order that additional paper copies of any document be filed. Can I telephone the court to speak to a judge or special master about my case? No, all communications with a judge—outside of scheduled proceedings—must be in the form of a written motion. General questions about your case may be directed to the Clerk’s Office by calling (202) 357-6406. How do I file a complaint against a judge of your court? For information on how to file a complaint against a judge of this court, click here. How can I obtain a copy of a decision? Decisions of the court are available on PACER and are also available for free on this page. What are the most common fees in the United States Court of Federal Claims? A complete schedule of fees is available at http://www.uscfc.uscourts.gov/fee-schedule. How can I obtain a copy of the Rules of the United States Court of Federal Claims? Click here for the Rules of the United States Court of Federal Claims and the Vaccine Rules of the United States Court of Federal Claims. How can I get copies of forms? 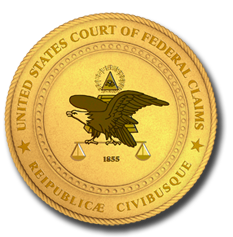 Click here for the Appendix of Forms of the Rules of the United States Court of Federal Claims. Other forms and instructions, such as an Application to Proceed In Forma Pauperis, are available at http://www.uscfc.uscourts.gov/other-forms-instructions. You may also call the Clerk’s Office at (202) 357-6406. How can I get a copy of a brief, motion, etc.? All documents filed in cases that have been designated ECF cases (with the exception of sealed documents) are available online via PACER. For more information on PACER, click here. The Clerk’s Office will copy any document for $0.50 per page. You may come to the court and view any documents, but court documents cannot be taken outside the Clerk’s Office. How do I get a certified copy of a court document? To request a certified copy of a court document, please call the Clerk’s Office at (202) 357-6406. There is an $11.00 charge for a certified copy in addition to the copying costs of $0.50 per page. How can I get an audio copy of a hearing? For information on how to request an audio CD of a proceeding, please visit http://www.uscfc.uscourts.gov/transcripts. Filing fees in electronic cases may be paid through the Pay.gov electronic filing fee tool in CM/ECF. All other payments must be made by check or money order (payable to Clerk, U.S. Court of Federal Claims). How do I request a refund of an erroneously paid fee? To request a refund of fees erroneously paid through the Pay.gov electronic filing fee tool in CM/ECF, please see our Electronic Filing Fee Refund Policy. All other requests for refund may be made in writing to the Clerk of Court. Where do I file a notice of appeal and where do I pay the fee? In general jurisdiction cases, to appeal a judgment of this court, a party must file the notice of appeal and pay the filing fee with this court. See Rule 58.1, Rules of the United States Court of Federal Claims. In vaccine cases, to obtain review of a special master’s decision, a party must file a motion for review with this court. See Vaccine Rule 23(a), Rules of the United States Court of Federal Claims, Appendix B. To appeal a judgment issued by the judges of this court, a party must file a notice of appeal and pay the filing fee with the United States Court of Appeals for the Federal Circuit (i.e., a petition for review under 42 U.S.C. § 300aa-12(f)). See Vaccine Rule 32, Rules of the United States Court of Federal Claims, Appendix B. If I have been permitted to proceed in forma pauperis in the U.S. Court of Federal Claims, am I required to pay the filing fee for an appeal to the Federal Circuit? If you are not a prisoner and were permitted to proceed in forma pauperis in the U.S. Court of Federal Claims, then you may proceed on appeal in forma pauperis without further authorization. See Rule 24 of the Federal Rules of Appellate Procedure. What technology is available in your courtrooms? For information on courtroom technology and for any special requests, such as assisted listening and interpreter systems for the hearing impaired or wheelchair access, please visit this page. I live outside of Washington, DC, and cannot afford to travel to the court for a proceeding. What should I do? If you are a party to the case, you may file a motion to participate in the proceeding by telephone or videoconferencing. What is allowed in your courtrooms? Click here for information on courtroom decorum. How do I become admitted to the bar of your court? For information about attorney admission to the U.S. Court of Federal Claims, click here.